REUTERS/Lucy NicholsonBuy Tesla? Sure, why not. Earlier this year, investors were getting antsy with Apple. The company’s revenue growth looked as if it would grind to a halt as consumers skipped the iPhone 5S. Tim Cook promised new products “across 2014,” but there was nothing new. There weren’t even reliable rumours that new products were coming until the end of the year. 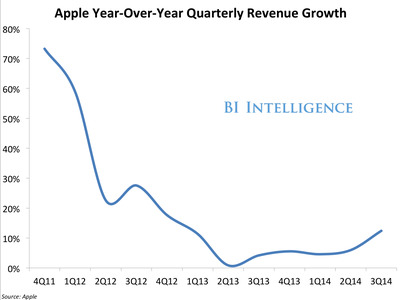 BI IntelligenceApple’s revenue growth chart was looking pretty scary earlier this year. Apple’s stasis was exaggerated by the activity from its rivals. Google bought Nest. Facebook bought WhatsApp and Oculus. Apple bought … Apple shares. It announced in The Wall Street Journal that it spent $US14 billion on share buybacks. Pundits started getting antsy. Eric Jackson, a fund manager who writes at various business sites, implored Apple to do something. A few months later, Apple listened. Sort of. 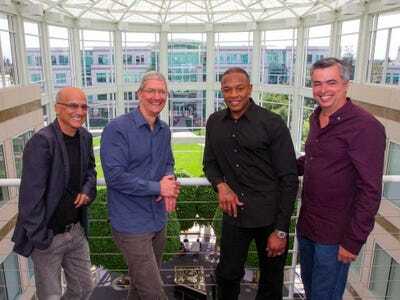 It paid $US3 billion for Beats, which helped silence the critics who wanted Apple to do something. However, it wasn’t Beats that shut people up. It was these five things: The iPhone 6, iPhone 6 Plus, Apple Pay, the Apple Watch, and Apple’s stock rising ~54% from its low point on the year. The Apple Watch and Apple Pay are new product categories. The iPhone 6 and iPhone 6 Plus are blockbusters that are selling like crazy. And stock price, well, duh. Nobody, except for me. I still think the company should make one crazy acquisition. Imagine what Cook could do to streamline and fix Tesla’s manufacturing process. So, Apple buying Tesla could unlock Tesla’s potential to manufacture more cars. But there’s more to it. Elon Musk is a man of many interests. He is CEO of Tesla. He is also CEO of SpaceX, and he wants to go to Mars. He is chairman of Solar City. He has five children. He is going to send hundreds of satellites to outer space. By selling to Apple, he gets one thing off his plate. Apple will still want Musk around to run Tesla, but he won’t have to be as involved in the day-to-day of the company. Manufacturing problems will no longer be Musk’s problems; they will be Cook’s problems. 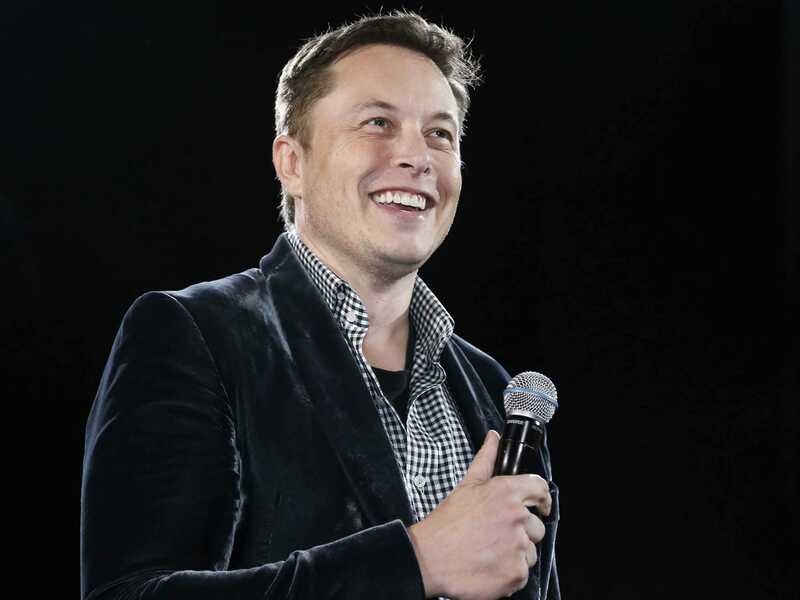 Reuters/Lucy NicholsonArguably, Tesla would be a giant acqui-hire. There’s a lot of overlapping interest between the companies. Apple is a great software company. Tesla’s software could use some work. Apple has been studying battery technology for years. Same with Tesla, so they could work on that for Tesla’s cars and Apple’s gadgets. From Apple’s perspective, buying Tesla is a far-out idea. But it is less crazy than buying Beats. At least Tesla is trying to create a significantly better future for consumers. Here’s why I think Apple should buy Tesla. First and foremost, Apple gets Musk, one of the boldest, most imaginative, future-thinking entrepreneurs in the world. In this fantasy acquisition scenario, Musk is put on Apple’s board, giving Cook access to Musk’s bright mind on a permanent basis. Secondarily, but obviously of equal importance, Apple gets Tesla, which makes a premium product. The Model S is the iPhone of cars. It’s much more expensive than its rivals, but its owners think it’s worth the premium. The Model S, like the iPhone, is a product that combines hardware and software. Tesla’s sales, expected to be about $US4 billion, are still a drop in the bucket for Apple, so they probably won’t move the needle all that much. 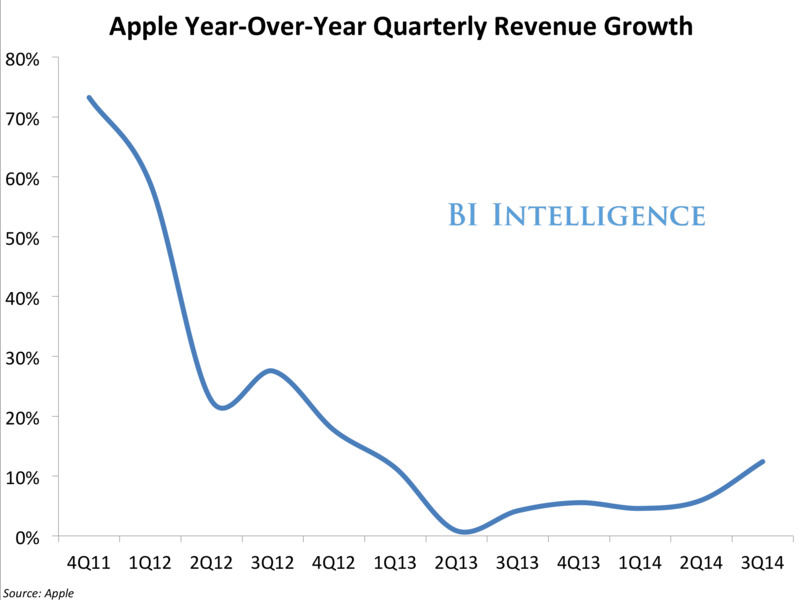 For context, Apple sold $US6.6 billion worth of Macs in the September quarter alone. The company’s total sales were $US42 billion. However, Tesla has strong sales growth. Sales are expected to be up 86% this year compared with last year. And, as we established earlier, Tesla could sell more cars if it could produce more cars. 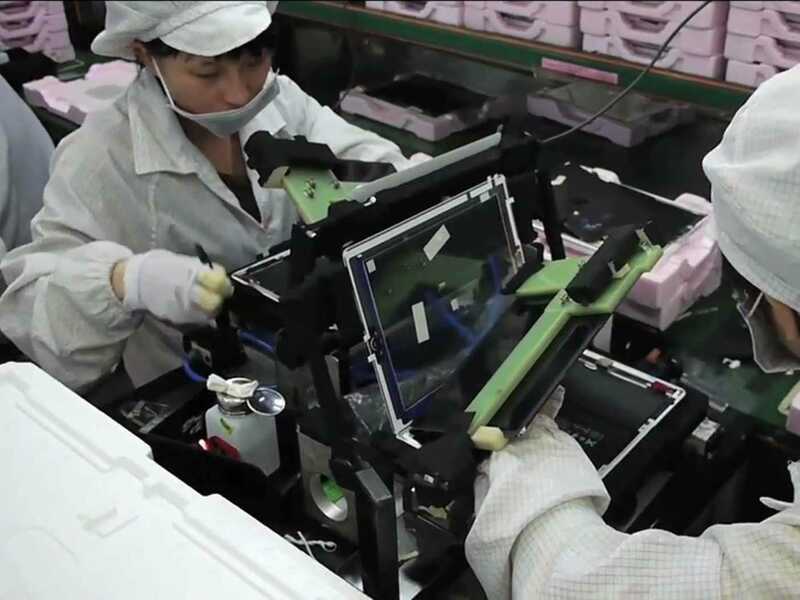 Apple should be able to increase production, and thus, sales. Why would Apple want to own a car company? Well, why does the company want to make a watch? Why do people want Apple to make a TV? Because this is what Apple does. It takes the most highly used devices in our lives and makes them much better. Besides, Apple is interested in cars. Jobs wasn’t the only Apple executive interested in cars. Eddy Cue, Apple’s SVP of internet services, is on the board of Ferrari. Phil Schiller, Apple’s SVP of marketing, is really into cars. His Twitter bio reads, “Apple, Sports, Cars, Science, Scuba, Drums, Photography. 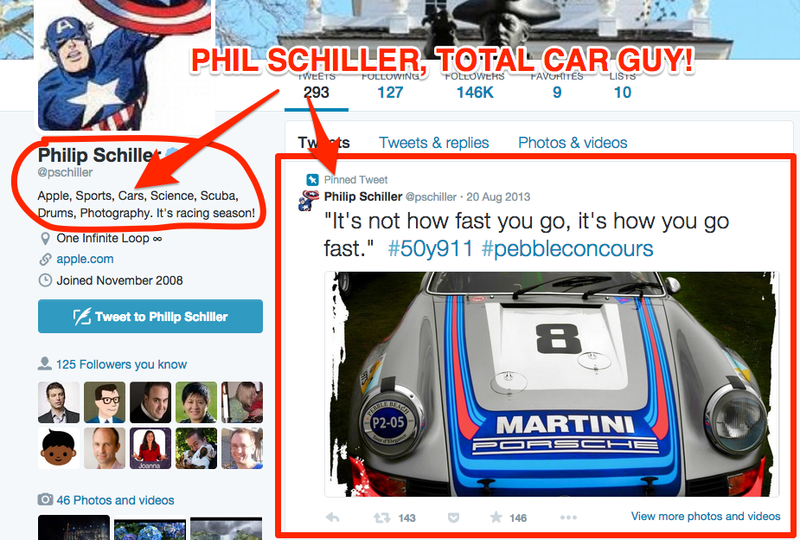 It’s racing season!” The tweet he has pinned to the top of his profile isn’t an Apple product, but a photo of a Porsche. Jony Ive, Apple’s head of design, is a big car guy, too. He owns a “fleet of cars” including an Aston Martin, a Land Rover, and a Bentley, according to a recent profile in Vogue. Newson is an industrial designer who is now working in a part-time capacity for Apple. Newson once designed a car for Ford. 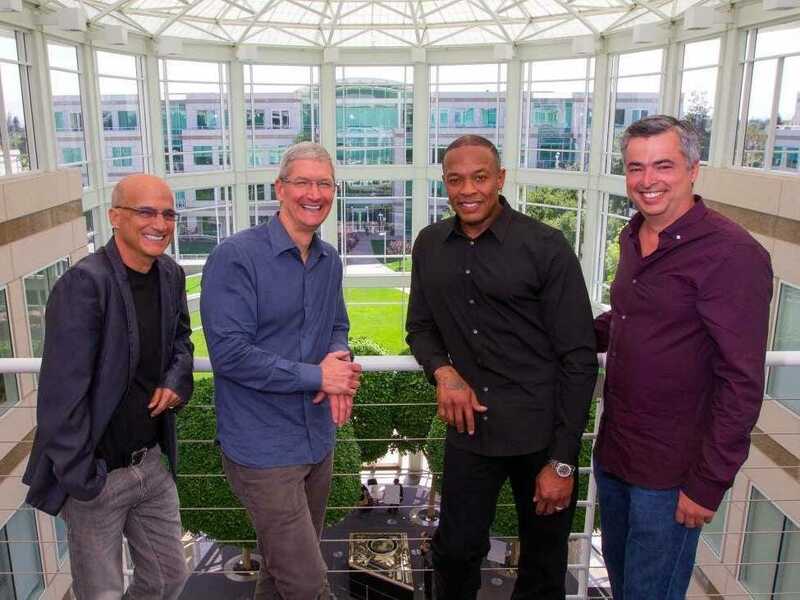 Obviously, the auto market is something of interest to Apple’s executives. Will Apple eventually make a car? I would guess that Apple will eventually make a car in the next 20 years. So, the company could wait and let the market shake out, then build its own from scratch. Or, it could be bold and buy Tesla right now. Is Tesla going to be a bigger or a smaller company in 20 years? The future is somewhat difficult to predict, but I would guess it’s going to be a bigger company in 20 years. So Apple should get Tesla now, while it’s still small and affordable. Now is the time to be bold. 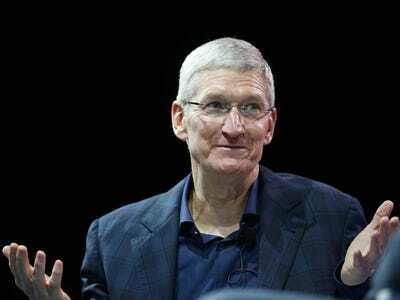 Apple has boatloads of cash. Investors are happy. Tim Cook should seize the future and buy Tesla. It’s a lot better than just buying more and more Apple shares.